Austin Air produces several of our most popular room air filters. They are well regarded for their exceptional value, long-filter life, economical operation costs, and all-purpose allergen, odor, and chemical contaminant removal. All Austin air purifiers / cleaners are designed and built in the USA to superior standards to give your family the highest level of protection and reliability. The quality of an Austin Air Cleaner is far superior to mass-produced brand-name units found in large retail stores. Furthermore, because you don't have to buy replacement filters (the most expensive part of the unit) every 8-12 months, Austin air cleaners are considerably cheaper to operate! 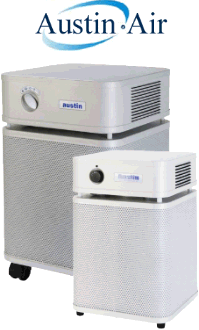 Originally designed and engineered specifically for allergy and asthma sufferers, all Austin air cleaner models feature both HEPA-grade particulate filtration to remove airborne allergens and particles, AND carbon filtration to remove more than 250 hazardous/noxious vapors, gases, and fumes. Austin air cleaners feature true medical-grade HEPA filtration technology originally developed by the U.S. Atomic Energy Commission. This is the highest standard in HEPA filtration available and is capable of removing more than 99.97% of all particles greater than 0.3 micron in size. In simple terms, the diameter of a single human hair is 300 times too large to penetrate the HEPA filter. Due to the dual HEPA / activated carbon filtration found in Austin air cleaners, they are also excellent for light industrial air filtration applications, including public buildings, labs, offices, and medical clinics. Our most popular general purpose medical-grade air purifier featuring a 4-stage filter system including 2 pre-filters, HEPA, and activated carbon. Specialty air cleaner specifically designed for those who are chemically sensitive. Specialty air cleaner with 60 sq. ft. of medical HEPA, certified to remove 99.97% of airborne particles 0.3 microns or larger. The Austin Air Pet Machine has a HEPA filter surrounded by a carbon/zeolite mixture which elimates many irritants associated with indoor pets. The HM200 HealthMate Jr. cleans up to 700 square feet, with 6.5 lbs. of Carbon-Zeolite mix and True Medical HEPA filter media for adsorption of odors and gases. The HealthMate Plus Junior provides the same benefits as the standard HealthMate Junior but provides greater relief for people with severe chemical sensitivities. The Austin Air Allergy Machine Junior has been developed specifically to offer maximum protection for those suffering from asthma and allergies. In the unlikely event that you're not completely satisfied with your Austin Air cleaner, return it within 30-days, no-questions-asked. See our return policy for more details. All Austin Air cleaners are warranted to be free from defects in material and workmanship for a period of 5-years from the date of purchase. Austin Air also offers a 5-year pro-rated filter warranty, by far the most comprehensive in the industry.